Roger Moore's good looks, charm, and wit made him a natural for stardom. A worldwide star before being cast as James Bond, Moore's easy sense of grace and savoir-faire brought the cinematic 007 unparalleled success in the 1970's and fantasy to the films at a time when movie audiences needed escapist entertainment of the highest caliber. Born in Stockwell, South London, Moore excelled at art as a youth. After school, he took a job at an animation studio working on War Office short films in the middle years of World War II. Moore lost his job but quickly reentered the film world. His father was a detective sergeant with the London Police and an amateur actor himself. He had met director Brian Desmond Hurst while investigating a robbery. Moore's father took Roger to meet Hurst and asked him to help his son become an actor. Soon, Moore's strikingly handsom looks were noted when he worked as an extra on Casar And Cleopatra (1945). With Hurst'sguidance, Moore found other small roles before joining the Royal Academy or Dramatic Arts, where one of his classmates was Lois Maxwell, the future Miss Moneypenny. "My personality is entirely different than previous Bonds." Elocution lessons at RADA smoothed the rough edges of Moore's South London accent, enabling him to play sophisticated leading men convincingly. In 1945, Moore was called up for military service. He has said he was recommended for officer training in part because of his good looks. After enduring postings in Germany, a car accident, and aooendicitis, Moore transferred to the Combined Services Entertainment Unit, becoming friends with many other actors and future directors. After leaving military service, Roger Moore acted in various television and stage productions in London and New York. His New York work attracted the attention of MGM Studios, who signed him to a contract to begin work on 1st April 1954. His first significant role was in The Last Time I Saw Paris (1954) opposite Elizabeth Taylor. Moore quickly became friends with many top names in show business, including Frank Sinatra, a good friend of Bond producer Albert R Broccoli. His contract lasted only three years, but it gave Moore a foothold in the film industry. Moore appeared in many films in the 1950's, but he really made his mark on television. In 1957, he starred in Ivanhoe, which was followed by The Alaskans, Maverick, and then The Saint, which lasted from 1962 to 1969. Moore was one of the names considered for the role of James Bond in 1961 when Connery was cast. Moore's worldwide success as Simon Templar, the legendary adventurer created by Leslie Charteris, made him one of the most recognizable actors of the 1960's. As his fame grew, so did the interest in casting him as 007. When Sean Connery announced he was leaving the role of Bond in 1966, producers Albert R Broccoli and Harry Saltzman discussed casting Moore as Bond in The Man With The Golden Gun. The film was to have begun production soon after You Only Live Twice was completed, with Cambodia as a key locale. When political violence erupted in the country, the producers shelved the idea of making the film. Moore's commitment to The Saint prevented him from assuming the role when they decided to make On Her Majesty's Secret Service a year later. When the producers needed to replace George Lazenby, they again reached out to Moore, but his commitment to a new television series The Persuaders prevented him from taking the role. Finally, in 1972, the stars aligned, and Moore accepted the role of James Bond. "I'm not that cold-blooded killer type. Which is why I play it mostly for laughs." Roger Moore's first 007 film Live And Let Die significantly outgrossed Connery's previous Bond, Diamonds Are Forever, firmly establishing Moore as a success as Bond. 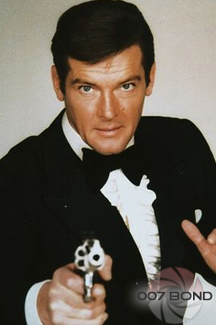 By the time Moore retired from the role of 007 in 1985, he had redifined the character of Bond and brought in over one billion dollars in worldwide box office, Moore earned a reputation for being an affable presence on the set, often engaging in practical jokes, or backgammon matches with producer Broccoli. Moore continued to star in other films during his years as Bond, including numerous action-adventures, such as Shout At The Devil (1976) and The Wild Geese (1977). After 007, Moore continued to make film and television appearances, but at the request of his friend Audrey Hepburn, he began work as a Goodwill Ambassador for UNICEF (the United Nations International Children's Emergency Fund). Moores work has taken him around the world, helping to raise money and awareness for global issues facing the planet's children. As James Bond, Roger Moore saved the world onscreen. As a UNICEF Goodwill Ambassador, his efforts have helped save real lives on a global scale.